One of the worst things about moving to the Pacific Northwest is the time zone! I start getting calls in the early morning here in N.C. based on East Coast timing but then all the stuff that comes out of the PNW goes on at least till 8 or 9pm, depending on how late they stay in the office. It is like the day never ends! I am also not too crazy about the idea about being 3 hours behind the East Coast once I get out there. I am so used to things being ‘live’, like the Today show. Now everything will be taped/delayed. Not sure how long it will take to adjust to that! I’ll have to look at the positives, like the Oscars will end at a reasonable time of night! Anyway, I am inching closer! Today I got my corporate housing confirmation so I have an address and a phone number for at least a little while. 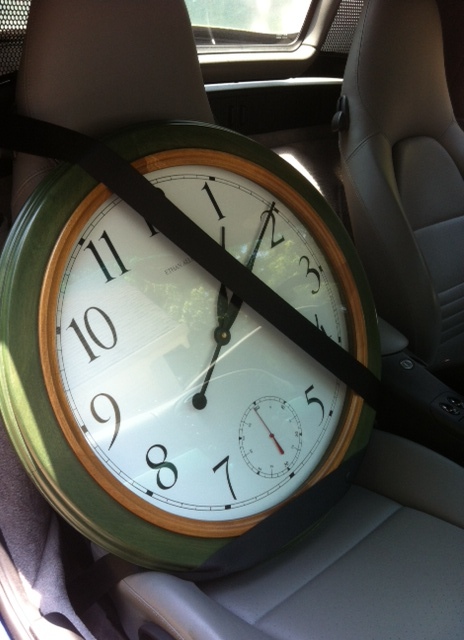 I also went to pick up my clock from the repair shop, that was funny as the guy in the shop really liked the clock and carried it out and carefully buckled it up in my little sports car. It will be challenging to find all these kinds of places once I get out there. I know who to call or where to go for so many odd things here (like clock repair, and the chip on my oven) but will be “Clueless in … ” once I get out there! At least I have a sister and brother-in-law that can help me with some of that kind of stuff. I have some realtors lined up, I have to have 3 assessments on the house and then it is supposed to be put on the market at the average of their feedback (all part of the relo policy). This entry was posted in Uncategorized and tagged relocation. Bookmark the permalink.